A delicate dab or two of color on Krishna Temple attendees’ foreheads was once the extent of Utah’s Holi Festival of Colors—the Hindu holiday celebrating the welcoming of spring and the mythological triumph of good over evil. About 15 years ago, local Yogi Shah changed all that with one reflexive gesture. “He did what Indians do—just smear a bunch of colors on someone’s face as he walked by,” says event coordinator Caru Das. A moment of stillness ensued, then everyone burst into laughter. “That was the official beginning of the festival,” Das says with a laugh. 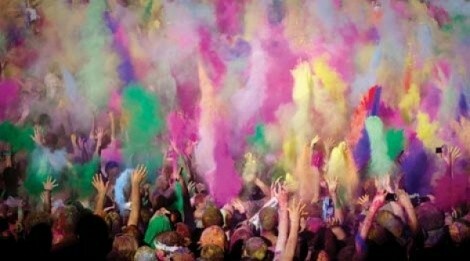 Now, with more than 25,000 attendees, Krishna Temple hosts America’s largest Festival of Colors. To make the festival more manageable and less stressful for participants, they’ve expanded it to two days, with color throwings every two hours. After a countdown, a kaleidoscopic explosion of pigment fills the air like a powdered, sandelwood-scented rainbow. These nontoxic, organic powders are sold at the event; outside colors are not permitted. There’s also an array of sumptuous Indian food and lively music. Local acts join several national “mantra rock” bands, who play danceable grooves over ritual chants like the Hare Krishna mantra.